India's Mars orbiter mission left Earth's sphere of influence early Sunday after performing a maneuver to put it on its way to orbit the red planet. The spacecraft fired its main engine for more than 20 minutes to reach the correct velocity to leave the Earth's orbit, the Bangalore-based Indian Space Research Organization said. "The Earth orbiting phase of the spacecraft ended. The spacecraft is now on a course to encounter Mars after a journey of about 10 months around the sun," the statement said. It said that all systems onboard the spacecraft are performing normally. India launched its first spacecraft bound for Mars on Nov. 5, a complex mission that it hopes will demonstrate and advance technologies for space travel. 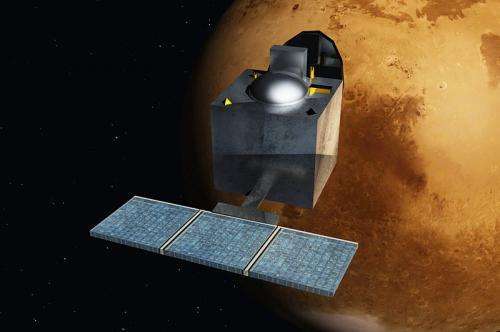 The 1,350-kilogram (3,000-pound) orbiter Mangalyaan, which means "Mars craft" in Hindi, must travel 780 million kilometers (485 million miles) over 300 days to reach an orbit around Mars next September. 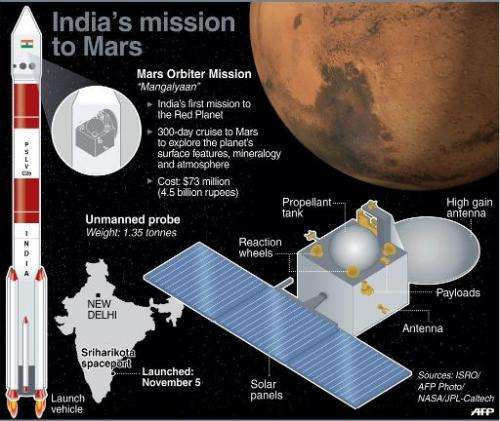 If the mission is successful, India will become only the fourth space program to visit the red planet after the Soviet Union, the United States and Europe. Some have questioned the $72 million price tag for a country of 1.2 billion people still dealing with widespread hunger and poverty. But the government defended the Mars mission, and its $1 billion space program in general, by noting its importance in providing high-tech jobs for scientists and engineers and practical applications in solving problems on Earth. Decades of space research have allowed India to develop satellite, communications and remote sensing technologies that are helping to solve everyday problems at home, from forecasting where fish can be caught by fishermen to predicting storms and floods. The orbiter will gather images and data that will help in determining how Martian weather systems work and what happened to the large quantities of water that are believed to have once existed on Mars. It also will search Mars for methane, a key chemical in life processes that could also come from geological processes. Experts say the data will improve understanding about how planets form, what conditions might make life possible and where else in the universe it might exist. The orbiter is expected to have at least six months to investigate the planet's landscape and atmosphere. At its closest point, it will be 365 kilometers (227 miles) from the planet's surface, and its furthest point will be 80,000 kilometers (49,700 miles) away. It is very interesting to see what can be done with "low-cost" space exploration. I think it actually looks cool. It's different to what we usually see. West is always behave very badly to Asian People. Any Type of technological advance in Asians will not digest to them. And the first call centre on Mars is established. Press 1 for rover technical problem. Press 2 for atmospheric analysis. or stay on hold to speak to one of our Martians.